One fine day in 1979, a man named Philip J. Romano converted an old bank into a restaurant so the world can have “better” hamburgers. Thus was born Fuddruckers, the fast casual restaurant chain that counts 56 company-owned locations and 129 franchises across the U.S. and others in Canada (Saskatchewan), Puerto Rico, the Dominican Republic, and Saudi Arabia as of 2011. Romano’s concept revolved around the idea of burgers which had meat ground on-site, their buns baked right in the restaurant, and tomatoes and onions that were freshly sliced, the lettuce washed right before serving, and cheese sauce in vats. Fuddruckers was neck to neck against bigger chains like Flakey Jake’s in California and was purchased by Michael Cannon in 1988. “The World’s Greatest Hamburger”: Is It Sill? And while the majority of the food items on the Fuddruckers menu wouldn’t get a dyed-in-the-old nutritionist excited, you can always enjoy some food options if you make an informed decision about what and what not to eat when you happen to be in any Fuddruckers outlet. Here are of those options (take note that some locations may have some items unavailable in others and vice versa). There are Whoppers and Big Macs have no cousins at Fuddruckers because a customer here is offered a single, one pound burger cooked to the specs the customer provides, after which the customer chooses whatever topping or toppings he or she desires; this single burger is cheaper than the specialty burgers with prepared toppings which, incidentally, are free. • Texas Burger with pepper Jack cheese and grilled jalapeños. • Fudd 77 with green chile and American cheese. • Bacon Cheddar with cheddar cheese and smokehouse bacon. • Swiss Melt with onions, grilled mushrooms, and Swiss cheese. • Southwest with smokehouse bacon, pepper Jack cheese, and guacamole. • Three with Swiss, cheddar, and American cheeses. • The Works with American cheese, smokehouse bacon, and grilled mushrooms. There are different seasonings and sauce to compliment your choice of burgers including A1 barbecue sauce, relish, and pepper sauce as well as hot melted cheese. These condiments can also be used on food items from their menu selection of “Lighter Options” that includes salmon, turkey, veggie, ostrich, and buffalo burgers. 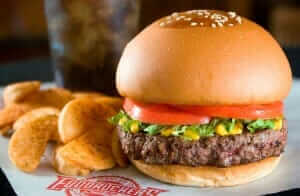 This concept was conceived by Bill Gillen, vice president for culinary operations at Fuddruckers. According to Gillen, these “Lite” Burgers are, not surprisingly, served on whole wheat buns instead of regular white buns and the bun-less burgers were conceived to cut down on the carbohydrates. Together with these “lite” sandwhiches, Fuddruckers now also has lower calorie sides and add-ons such as Ranch and Italian low-fat dressings, low-sodium Alpine Lace, low-fat American cheese, and fresh seasonal fruit salads. Additionally, Gillen mentioned that their whole buns are made from scratch and their salads now have grape tomatoes as well as mesclun greens to supplement the entire “Lite” concept. Four of these “Lite” burgers – ostrich, veggie, ostrich, and turkey – are on the menu as limited-time items and this will only be the first time that they appear simultaneously on the menu. While the salmon burger is new in the burger lineup, buffalo and ostrich are menu regulars. This is because the former has a loyal patronage from the bevy of customers who have tried, and liked, buffalo meat, and the latter, while similar in taste to ground beef, is actually lower in fat like salmon is. Bringing in seafood such as salmon has drawn more seafood-loving customers as well. In putting out a menu that has lighter options to ground beef and chicken, Fuddruckers is also making an effort to meet the needs of their female consumers who are trying to lose weight or maintain the weight level they are on. Better late than never is what Fuddruckers is focusing on with regard to hitching its stars to the bandwagon of advocating healthier food options, according to food industry consultant Darren Tristano of Technomic. The “Lite” Options menu will encourage more people to try out Fuddruckers precisely because of these nutritious burgers, not to mention piquing the interest of adventurous food lovers who will find eating ostrich and buffalo burgers on this side of exotic. Six ounces of ostrich meat tastes the same as a burger with less than 200 calories and only four grams of fat. The same serving of ground beef will give you 480 calories with 30 grams of fat. Buffalo meat, on the other hand, already has a following among consumers who are aware that it is lower in fat but higher in protein than bovine meat; even the taste is the same. Other meat sources offered by Fuddruckers include those from elk and wild boar, albeit these are dependent on the preferences of consumers in particular geographic locations. Elk burgers are savory, lean, have low sodium content, and has no trans fats. The wild boar hamburgers, meanwhile, have zero trans fats as well, are low in saturated fat and sodium, and have a mildly sweet, smoky flavor. All of these Exotic Burgers are free range, grain- and grass-fed, are all-natural game and, together with the wild salmon variety used for the sandwiches and entrées aboard the Voyager of the Seas are all free from antibiotics and hormones.